Hairdresser's disease is an occupational acquired interdigital pilonidal sinus (IPS) of especially male barbers. Here, two cases of IPSs are reported. Both cases underwent surgical excision and primary closure. Six months follow-up period did not present any complications or recurrence. Caused by repeated implantation of foreign hair to the interdigital web space, IPS is preventable, but once acquired treated with surgical excision and primary closure or with a skin flap for postoperative comfort. Hairdresser's disease is an occupational acquired interdigital pilonidal sinus (IPS) of especially male barbers. Interestingly, IPS contrasts with other variants of pilonidal sinus in that it is not caused by the patient's own hair and occurs in nonhair-bearing areas. Caused by repeated implantation of foreign hair to the interdigital web space, IPS is a preventable disorder. Herein, we present two male hairdressers with IPS and their surgical treatment. 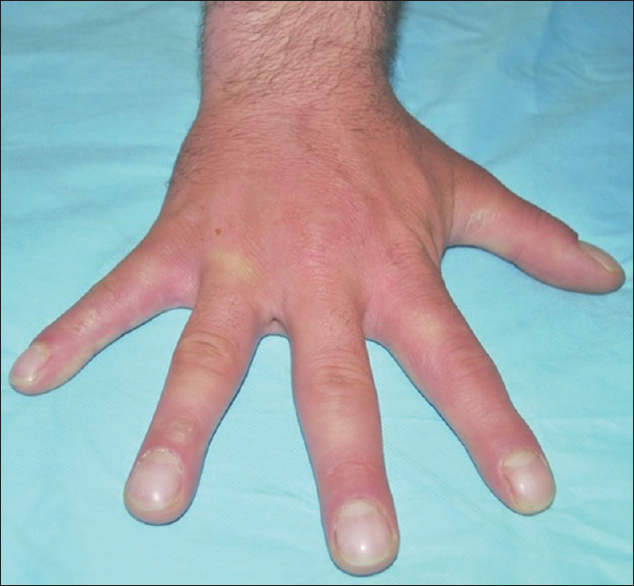 A 31-year-old male who has been working as a male hairdresser for 12 years presented with 4 months recurrent infection and pain in the third web space of the right hand. Physical examination findings were purulent discharge from an 8 mm diameter sinus opening in the third web space of the right hand [Figure 1]. The patient had pain upon palpation. Short, stiff male hair was observed at the opening of the sinus. He had a history of treatment with antibiotics, but no relief of complaints. Eight years ago he had a surgical excision of sacrococcygeal pilonidal sinus that healed completely. Under local anesthesia, a 2.5 cm dissection was made, the sinus tract was revealed and totally excised. A 30-year-old male hairdresser presented to our clinic with complaints of mass, erythema, and pain at the third web space of the left hand that began 4 months ago. Physical examination showed a sinus opening and skin induration of 2 mm thickness around the opening. Under local anesthesia and a 2 cm incision, the tract was visible; hair, and purulent discharge were irrigated and the sinus was totally excised. In both patients, the defect was closed primarily. 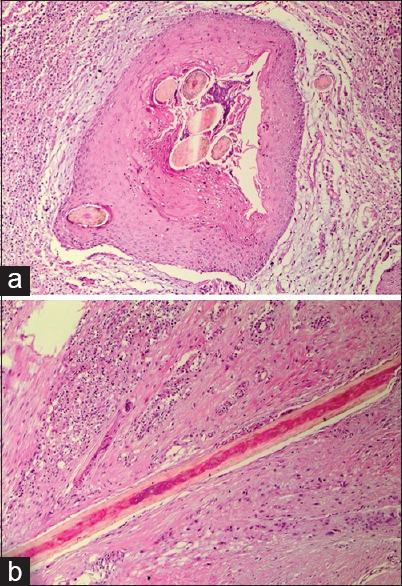 Histological examination revealed findings consistent with IPS [Figure 2]. With recommendations of using gloves and keeping dry, 6 months and 1-year controls did not show any recurrence of the disease. IPS is a rare occupational disease that is named Hairdresser's disease when it occurs in male barbers. The disease wasfirst described by Templeton in 1942, histologically defined as a foreign body granuloma. More than 50 cases of IPS have been reported in the English-language literature; but the number of cases reported as Hairdresser's disease is much less. Similar clinical findings have been reported from different occupational groups such as dog groomers or sheep shearers. IPS is caused by short male hair penetrating the soft skin of interdigital area, leading to the formation of a sinus and a cyst. Accumulation of hair and pilonidal sinus formation results in a purulent discharge with pieces of hair from the infected cyst. Most sinuses are asymptomatic so diagnosis of the disease might be underestimated. Primary closure is the preferred method of wound management and results in a less obvious scar than does secondary healing. Prevention is the most effective way of treating the disease. Providing hygiene conditions at work and using barriers like gloves are believed to prevent sinus formation. As a rare disease, dermato-trichologists and surgeons should be aware of Hairdresser's disease and offer surgical treatment. Uysal AC, Orbay H, Uraloglu M, Sensoz O, Hyakusoku H. Rare occupational disease of hair dressers: Interdigital pilonidal sinus. J Nippon Med Sch 2007;74:364-6. Templeton H. Foreign body granuloma or interdigital cyst with hair formation. Arch Dermatol Syph 1942;46:157-8. Papa CA, Ramsey ML, Tyler WB. Interdigital pilonidal sinus in a dog groomer. J Am Acad Dermatol 2002;47 5 Suppl: S281-2. Uysal AC, Alagöz MS, Unlü RE, Sensöz O. Hair dresser's syndrome: A case report of an interdigital pilonidal sinus and review of the literature. Dermatol Surg 2003;29:288-90. Patel MR. Chronic infections. In: Green DP, Hotchkiss RN, Pederson WC, editors. Green's Operative Hand Surgery. 1st ed. Philadelphia: Churchill Livingstone; 1982. p. 1035-93.